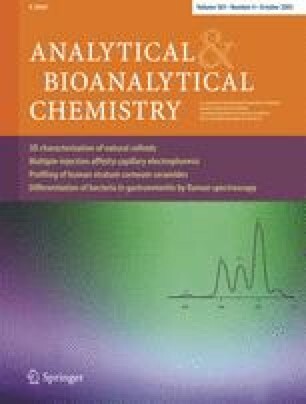 A method for determining ropivacaine in human plasma using highly selective molecular imprint-based solid phase extraction and LC–MS analysis was developed. The imprinted extraction material was prepared using a structural analogue of ropivacaine as the template. The efficient sample cleanup achieved allowed single MS mode operation and analytical separation under isocratic conditions with a total separation time of less than two minutes. The absence of ion suppression was confirmed for both the m/z of ropivacaine and the m/z of the internal standard. The solid phase extraction protocol was optimised for elution of ropivacaine in a small volume of aqueous-rich solvent suitable for injection into a reversed phase LC–MS system. The final method measured trace levels of ropivacaine in human plasma with a limit of quantification of 2.5 nmol/L and interassay accuracy and precision of 101.7–104.4% and 2.1–7.2%, respectively. Z.C. acknowledges the financial support provided through the European Community's Human Potential Programme under contract HPRM-CT-2002-00189 [AquaMIP]. We also thank Dr. Sellergren and his research group for the preparation of the molecularly imprinted polymers.